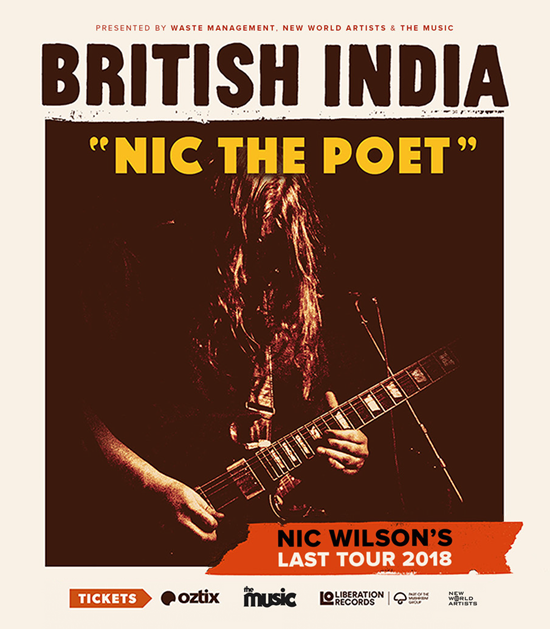 Guitarist and founding member of British India, Nic Wilson has announced he will retire from music at the end of this year, finishing up with one final tour - the Nic The Poet farewell tour. Guitarist and founding member of British India, Nic Wilson has announced he will retire from music at the end of this year, finishing up with one final tour - the Nic The Poet farewell tour - spanning 24 dates that'll see the iconic Melbourne rockers kick off at The Basement in Canberra on November 2, before swinging through Albury, Perth, Margaret River, Freo, Bunbury, Townsville, Cairns, Bendigo, Geelong, Sydney, Brisbane, Melbourne, Southport, Sunshine Coast, Adelaide, Shoalhaven and finishing up at Port Macquarie to play Westport Park on January 27, 2019. Formed at St Bede's college in Melbourne's eastern suburbs, British India burst onto the scene in 2007. A love of music and a driving determination was the key ingredient that turned four budding musicians into a fierce garage band, who quickly gained a reputation for explosive live shows and the ability to write great pop songs. A chance meeting with legendary producer Harry Vanda and future manager Glenn Goldsmith resulted in their debut album Guillotinebeing released independently in July 2007.' Supported by triple J radio and relentless touring the album would go onto sell 20,000 copies and the band won the AIR award for 'best new Group' in 2007. Within 12 months British India released their 2nd album Thievesto great fanfare. The album debuted at No 5 and was nominate for 3 ARIA awards. By the end 2008 British India had become one of the biggest young rock bands in the country. They continued to assent, releasing Avalanchein 2010, yet another Top 10 debut. At Liberation, British India would release their most successful albums to date, Controller& Nothing Touches Me. They also scored their first Gold Record with the hit I Can Make You Love Me. In 2017 they released their 6th studio album Forgetting the Futureagain playing a sold out national tour. "British India is something we started as snotty nosed high school kids, that became something much bigger and more important to people than we could have ever expected. The three lads in the band were the three best men at my wedding and the three best men to play a part in in my life. And I was lucky to live out the dream a 12-year-old version of myself pined for daily. To play music to people who cared. For that - I thank you. But time moves on and I have other things I want to try my hand at and I am ready to see what else I can do. Thank you for the memories everybody. Rock n Roll, I gave you the best years of my life." Always busy and currently in the studio working on new material, the band are excited to celebrate Nic Wilson's awesome career and plan to send him off in style with one final tour with their best mate. This will be the last chance to see the original British India line up on stage.